Much Thanks to Bob England for all the below photos! Originally built as a log cabin probably in the early 1820's since that is when William and Rhoda married. 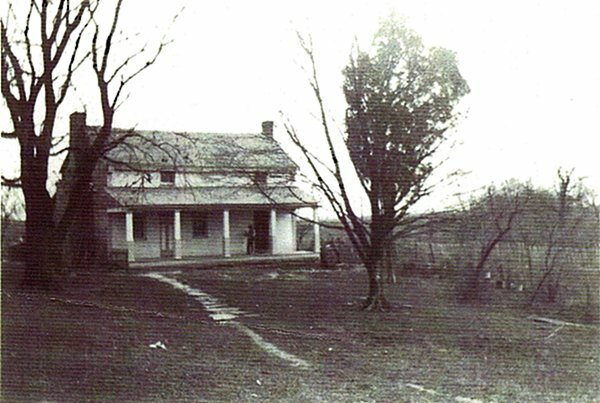 This house was then passed down to their son, Thomas Buford Aylor. Then in later years, it was sold to Moses Rouse and in the late or early sixties the house burned. At present, all that remains are the chimneys and a family burial plot of about thirty graves. 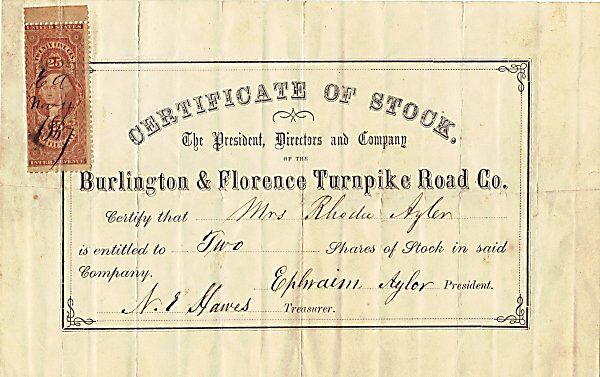 The above Certificate of Stock in the Burlington & Florence Turnpike Road Co.
was found folded in a wallet belonging to William Aylor (Rhoda's husband). The wallet had a small notepad sewn in and on the first page at the top was signed William Aylor, Dec. 28, 1828. The wallet is made from deerskin and has a tooled exterior. 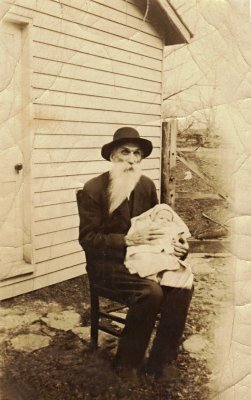 William Aylor was born 10 May 1799 in Madison County, Va, and died 12 Jan 1853. 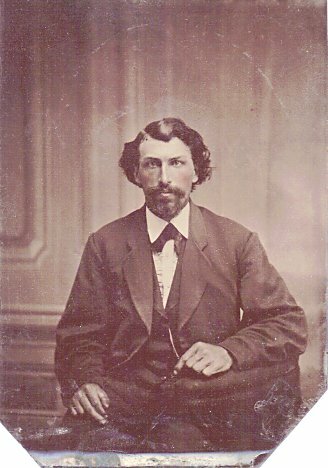 He married Rhoda Tanner 2 Feb 1820 in Boone County, Ky, daughter of Ephraim Tanner and Susanna House. Rhoda Tanner5 (Ephraim Tanner4, Frederick Tanner3, Christopher Tanner , Sr.2, Robert Tanner1) She was born 23 Dec 1801 in Madison County, Va and died 31 Oct 1876. William and Rhoda are both buried in the Aylor Graveyard near the home. 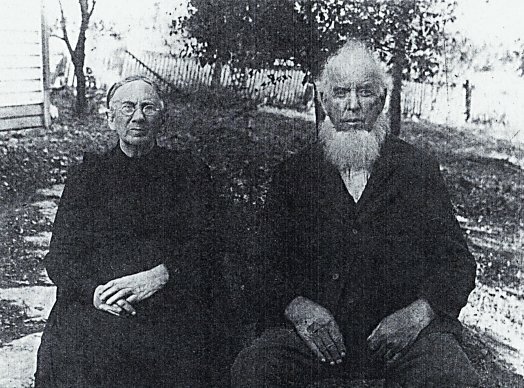 i. Absolom Aylor born 5 Feb 1821 Boone County, Ky; married Elizabeth Frances Utz 21 Dec 1848; died 21 Aug 1904.
ii. 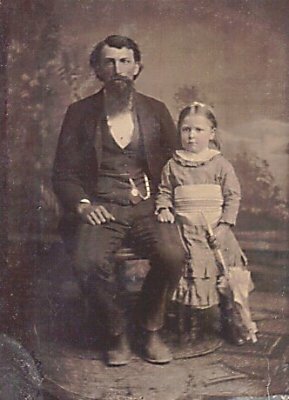 Johnson Aylor born 27 Mar 1822 Ky; married Nancy Margaret Crigler 21 Dec 1843; died 22 Dec 1894 Ky.
iii. Verinda Aylor born 5 Feb 1824 Ky; married Jonas Clore on 6 Mar 1845; died 25 Apr 1908.
iv. 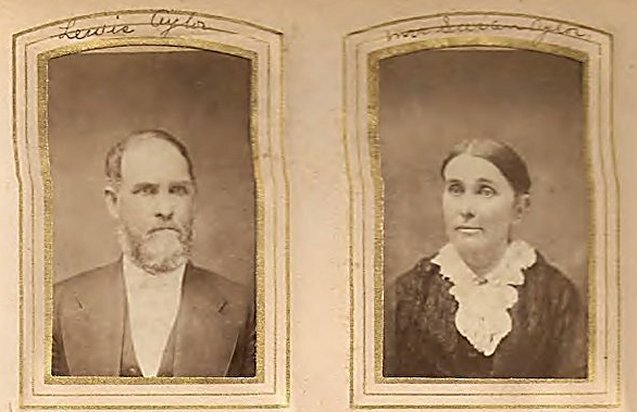 Permelia Ann Aylor born 25 Jul 1825 Boone County, Ky; married Aaron Henry Crigler on 13 Apr 1843; died 4 Jan 1911 Constance, Boone County, Ky.
v. Jemeson H. Aylor born 24 Feb 1827, married Sarah Jane Hicks on 5 Apr 1849; died 10 Feb 1908. Below is a photo of Jemeson Aylor and a photo of him with his wife Sarah Jane. vi. Benjamin Aylor born 16 Oct 1828 Ky; married Mary F. Adams. vii. 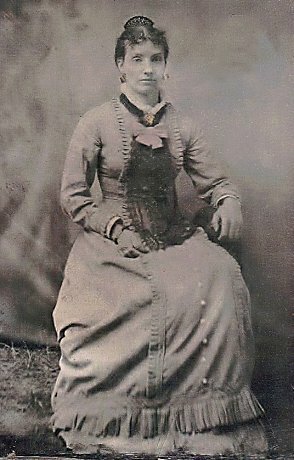 Lystra Aylor born 12 Jan 1830 Boone County, Ky; married Harriet Helm on 13 Jan 1852.
viii. 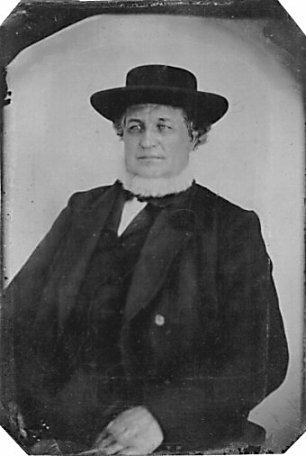 Ephraim Aylor born 16 Sep 1831 Ky; married Elizabeth Craven on 6 Apr 1854; died 16 Sep 1898. Middle Initial 'T' is thought to be for 'Tanner'. 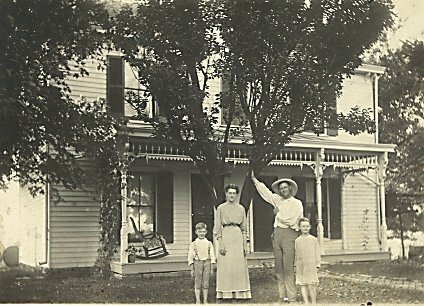 Below is a photo of William T. Aylor with his wife Mary Ann Helm which has been cropped from the large Family Photo below. 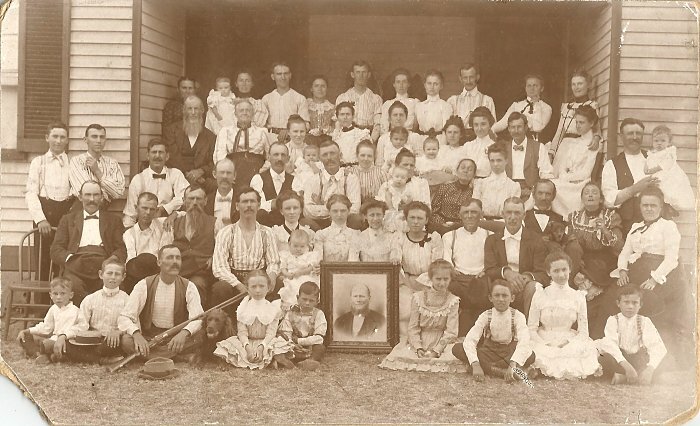 William T. Aylor and his wife Mary Ann are on the far right in the 3rd row from the bottom. Thank you to Diane Aylor Miller for this photo! 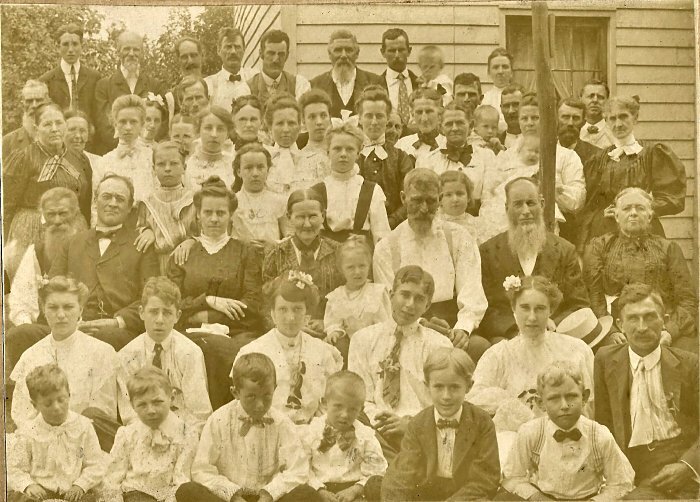 William T. Aylor and his wife Mary Ann are on the far left in the 2nd row from the top. 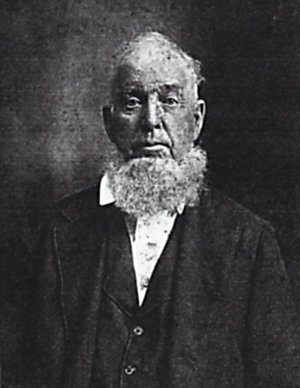 x. Henry Aylor born 23 Apr 1835 Ky.
xi. 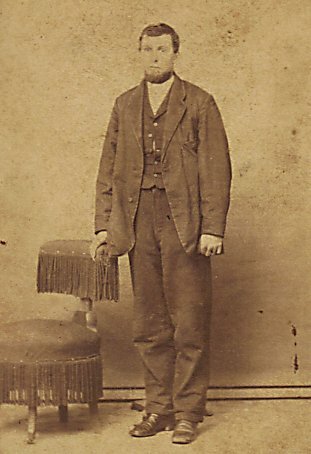 Martin L. Aylor born 10 Feb 1837 Boone County, Ky; married Sarah Francis Rouse on 7 Feb 1865; died 7 Feb 1865.
xii. 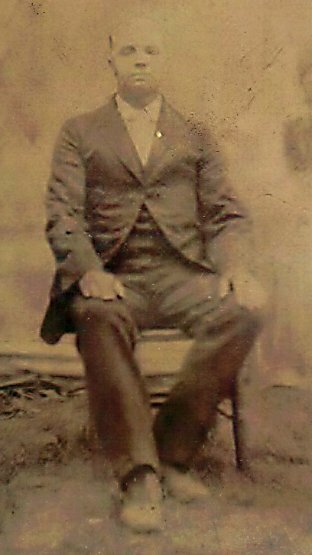 Thomas Buford Aylor born 3 Jul 1844 Ky; married Julia Crisler Jones on 30 Aug 1863; died 30 Jan 1929.
was born 27 Mar 1822 in Ky. 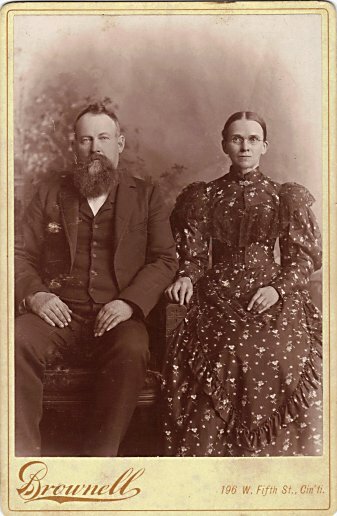 He married Nancy Margaret Crigler 21 Dec 1843 in Boone County, Ky, daughter of Nicholas Crigler and Sarah "Sallie" A. Fray. 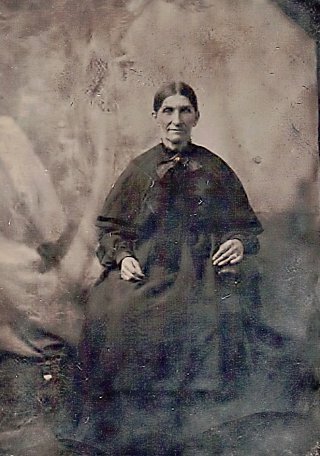 She was born 7 Jan 1823 in Ky.
Johnson Aylor is listed as a Farmer on the 1850 and 1860 Boone County, Ky. Federal Census. Johnson Aylor died 22 Dec 1894 Ky and his wife Nancy Margaret Crisler died 11 Apr 1896.
i. William Nicholas Aylor born 16 Oct 1846 Boone County, Ky, died 21 Jan 1890.
ii. Moses Aylor born 28 Jan 1849 Hebron, Boone County, Ky, and died 24 Jul 1934 Hebron, Boone County, Ky. 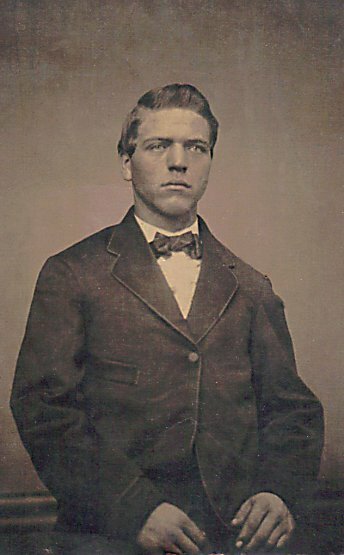 He married Hattie Ann Snyder, daughter of Julius Franklin Snyder and Hester Ann Wilhoit. 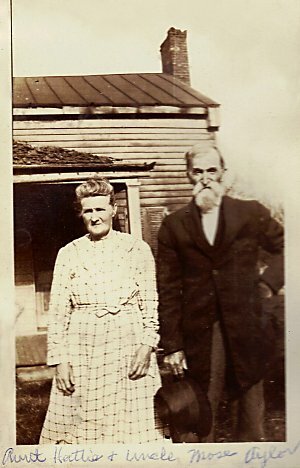 She was born 7 Dec 1862 in Florence, Boone County, Ky; and died 23 Dec 1931 in Burlington, Boone County, Ky.
Below is a photo of Moses Aylor 1849-1934 and a photo of he and his wife Hattie. which was situated behind the Catholic church and was originally the Johnson Aylor home. iii. Henry Johnson Aylor born 1 Feb 1852 in Boone County, Ky; died 7 Dec 1932 in Hebron, Boone County, Ky; buried in Hebron Lutheran Church Cemetery. 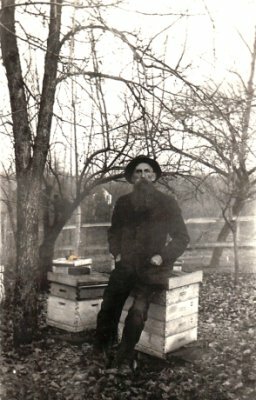 Photo 2 : Henry Johnson Aylor next to his beehives by his home. Photo 3 : Henry Johnson Aylor holding his grandson Wayne Jones. 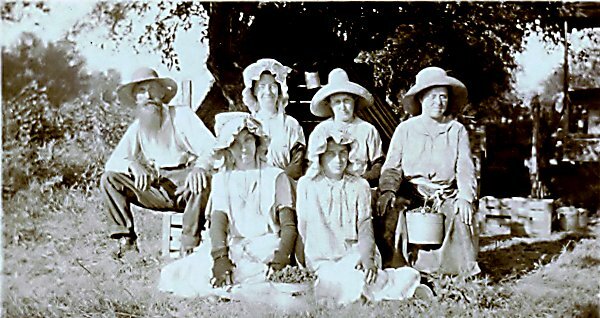 In the photo is Henry Johnson Aylor and several of his nieces, a nephew’s wife and one unknown connection. 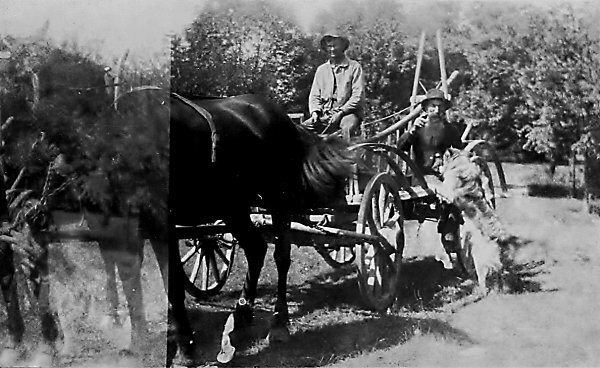 This photo is of Henry J. Aylor on the side of wagon with dog “Kelly”. Driving the wagon is his son-in-law Wm. “Bill” England. 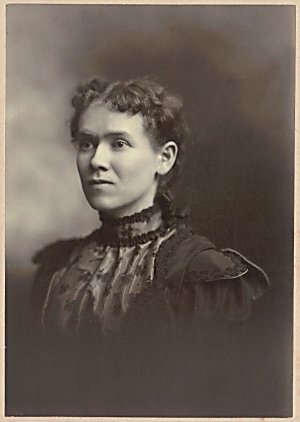 Photo possibly ca.1916. 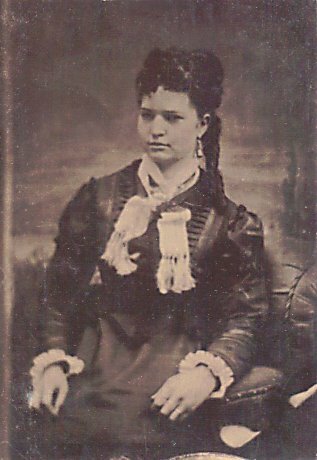 Henry Johnson Aylor married first wife Pauline Gordon 1 Aug 1875 Boone Co Ky.
She was born 10 Dec 1858 Boone Co Ky; died 9 Feb 1880 Ky.
Below is a photo of Pauline Gordon Aylor. She was buried in Aylor Graveyard, Boone Co Ky.
Henry Johnson Aylor married his second wife Addie Adelia Rouse 7 Oct 1884 Boone Co Ky.
She was the daughter of William Addison ROUSE and Sarah Frances GORDON. 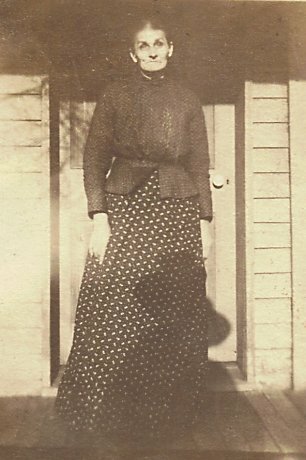 She was born 27 Jun 1868 in Kenton Co Ky; died 13 MAR 1967 in Boone Co Ky.
iv. ___ Aylor born 25 Jul 1854 Boone County, Ky; died 26 Oct 1854 in Boone County, Ky.
v. Amanda F. Aylor was born 8 Jan 1856 in Boone County, Ky; died 2 Nov 1940 Burlington, Boone County, Ky.
She married Jacob S. Lodge. 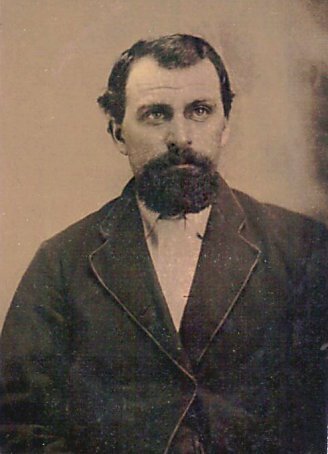 He was born 10 Apr 1852 Boone County, Ky; died 12 Jun 1920 Bullitsville, Boone County, Ky.
vi. Alonzo Aylor born 8 Dec 1858 Boone County, Ky; died 26 Oct 1902. 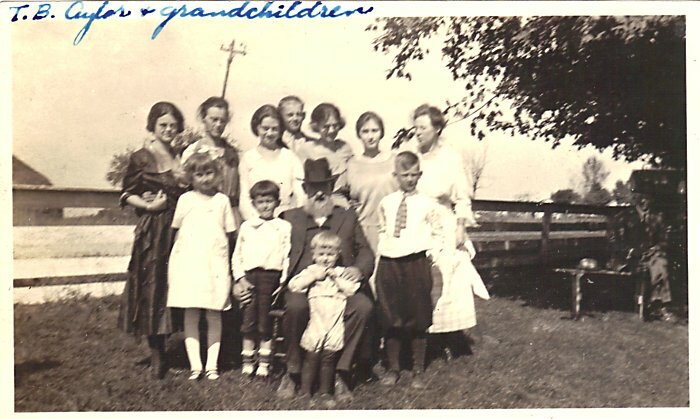 The one on the left at a younger age is thought to be Alonzo Aylor ~ The one on the right is is marked as being Alonzo Aylor. vii. Lucetta Aylor born 14 Jun 1861 Boone County, Ky; died 29 Oct 1930 Burlington, Boone County, Ky.
viii. Robert Lee Aylor born 14 Oct 1864 Boone County, Ky; died 29 Mar 1944 Hebron, Boone County, Ky.
Thomas Buford Aylor was born 3 Jul 1844 in Ky to parents William Aylor and Rhoda Tanner. 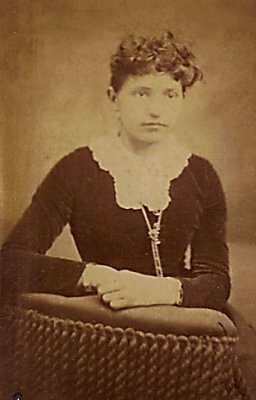 He married Julia Crisler Jones 30 Aug 1863, daughter of Gabriel Jones and Sarah ___. 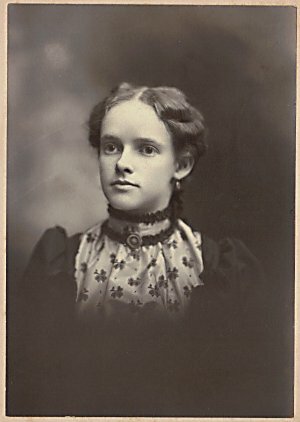 She was born 20 Mar 1847, and died 23 Dec 1896. Thomas Buford Aylor died 30 Jan 1929.
i. Tennie E. Aylor born 14 Nov 1866; married Clark E. Beemon 29 Sep 1886; died 14 Jul 1948.
ii. 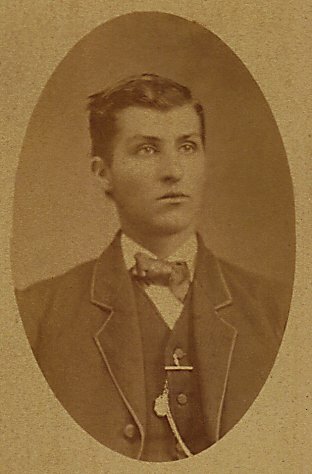 Ezra K. Aylor born 19 Feb 1869; married Zadie B. Beall. iii. Ada Ellen Aylor born 30 Apr 1871; died 9 Mar 1955.
iv. Lula Ann Aylor born 29 Nov 1873; died 24 Oct 1905.
v. Thomas Spencer Aylor born 10 Apr 1876; married Dora L. Hafer 28 Mar 1900.
vi. Charles Lee Aylor born 1 Oct 1878; married Susie L. Snyder 30 Nov 1904.
vii. Everett Leslie Aylor born 17 Jun 1881; married Mabel A. Vest; died 1 Aug 1944.
viii. 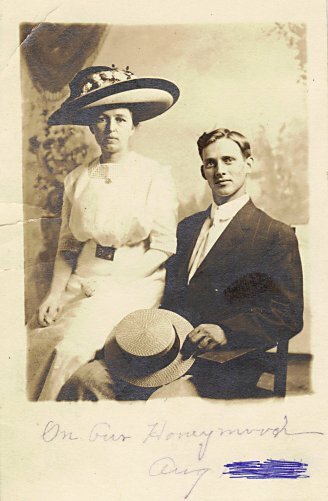 Lloyd Ephraim Aylor born 18 Sep 1884, married Emma F. Clutterback 24 Nov 1904; died 1969. Thomas married Julia Crisler Jones on 30 Aug 1863 in Boone Co, Kentucky. He died on 31 Jan 1928 in Boone Co, Kentucky and is buried in Hopeful Lutheran Church Cemetery, Florence, Ky. 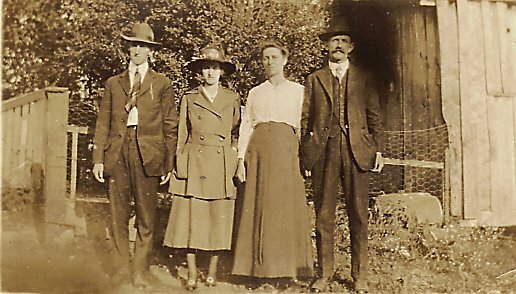 The 2 unknown females might be Artie Aylor and Irene Aylor Byrne?